Have you ever dreamed of having your own place, but you found all the fuss connected with buying or building the house discouraging? Worry no more! From now on you can build your own dream house in less than an hour, and it will not cost you a fortune. “Dream Home” is a family board game for two or more players. It is perfect for everyone: not only little kids and their parents, but also a group of friends wanting to have some fun. Build a house of your dreams with a living room, kitchen or bathroom, which could be, respectively, decorated with a piano, bookshelves or even a hot tub. The aim of the game is to create the most functional and the most beautiful house so that not only do you win the game, but also you are left with a nice plan of your house on a board. With the assistance of helper cards and tool cards you have much more opportunities to furnish you house better and, eventually, gain more points and win. Apart from the regular set of rooms, you also have a roof to complete and a garage to build. The game is played over twelve rounds. 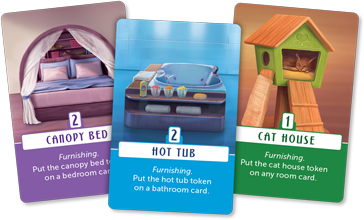 There are four home boards, where a player has to put his room cards and resource cards to build a house of his dream. A game board should be placed in the center of the table and after that room cards and resource cards are put in specified places on the board. Now, the game ma start. 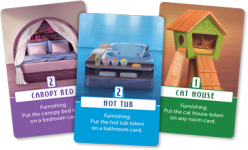 Players have to pick up one room card and one resource card in order to fill the blank spaces on their home board. Every room, depending on its type and size, together with décor tokens, gives players a respective number of points. The game ends when everyone has their home board filled with rooms. Score your points and see who gathered the most! Why will you love this game? The rules are incredibly simple and easy to explain. The game mechanics is so intuitive that you can play with a complete rookie. Even kindergarteners, with their parents’ help, can start their furnishing adventure! 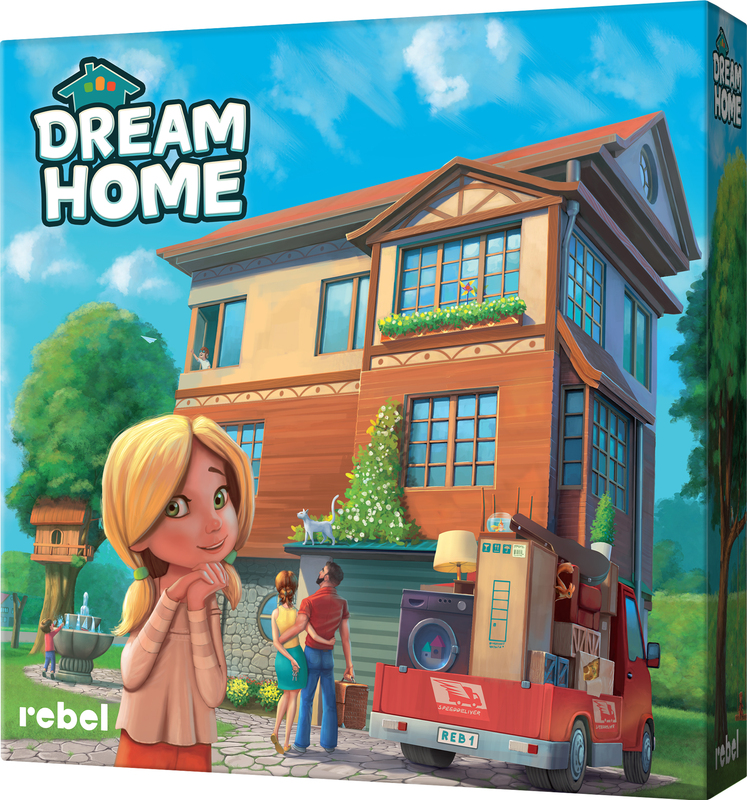 As a game with almost no negative interaction, “Dream Home” is perfect for players who seek board games to play in a warm and friendly atmosphere. Everyone is focused on their own house and has all the rooms ready by the end of the game, so no one is destroying the other person’s hard work. Thanks to possibility to expand rooms, existence of décor elements, and cards allowing to change the placement of the cards on your home board, you can show off your planning skills. The final success depends fully on the player’s ability to make good choices and effectively put room cards on his board. The game contains 108 various beautifully drawn, detailed cards with unique and fantastic rooms which will definitely catch your eye and make you want to play more and more! “Dream Home” is an internationally recognized game – the Polish game has been translated into English, Dutch, German, Italian, Chinese, Spanish, Czech, Russian and Korean. More to come!